GREENVILLE, Del. 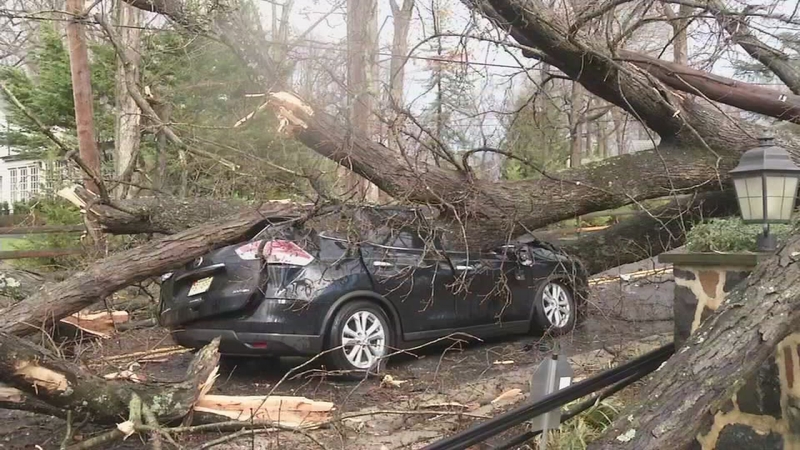 (WPVI) -- A tree fell and crushed a car in Greenville, Delaware during Thursday's storm. That massive tree crushed Victoria Franklin's car with her and her 17-year-old son inside on Barley Mill Road. And just minutes before she saw another tree fall. Franklin of Woolwich Township, New Jersey said, "I didn't see anything, I didn't hear anything until after it hit us. And the whole entire hood, the roof of the car was crushed in. We could see tree right above us, part of it inside the car." Medics transported both mother and son to the hospital with minor injuries after they climbed out of the vehicle. Franklin was driving, her son was in the passenger seat. It was around 4 p.m. Thursday after she picked up her son from the Tatnal School to make their trip home to New Jersey. Storms had just ripped through the Westover Hills section in Greenville, Delaware. New Castle County police retrieved Franklin's belongings, cell phones and keys. Franklin says she's still in shock and so is her son. After we got out of the car, and I looked at it, I just cried, I just cried, because my son and I are very surprised we got out of there," said Franklin. Most of the power has been restored to the neighborhood. Workers are on the scene from Verizon to move the tree off the lines. DelDOT will then clean up the mess.